This post is sponsored by 7UP®. All thoughts and opinions are, as always, 100% my own. Must be 21 or older to consume alcohol. Please drink responsibly. 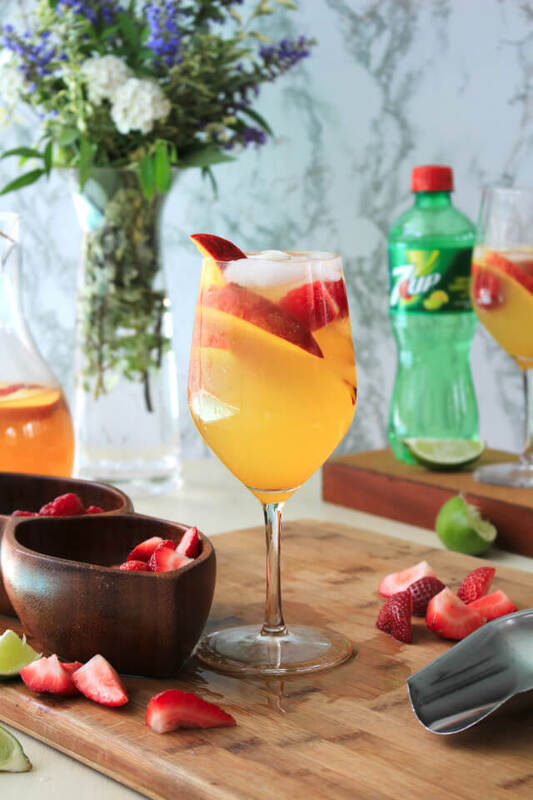 Moscato Peach Punch is perfect for all of your summer soirées, made with crisp Moscato wine, sweet peach nectar, and refreshing 7UP. If I'm going to be honest, I have to say that planning a party is almost as fun as attending a party. I don't mean for that to sound like I'm anti-social or anything. Quite the contrary. I adore anything from casual gatherings to celebratory events with friends and family. What I mean is that, when it comes to hosting a get-together, crafting the perfect seasonal menu, shopping for the best deals, and pulling everything together, I'm your girl. It's like an art if you really think about it. An art that I thoroughly enjoy. Truth be told, I've always been an artsy kind of gal and, well, food is my jam! I do write a food blog after all! Coming up with tasty food ideas for gatherings has always been easy for me. It's the drink part of the menu that I have struggled with in the past. You see, we have a large family. Lots of aunts and uncles and cousins and grandparents to consider. Back in the day, I would over-buy on booze and beverages in an effort to make sure I had exactly what everyone liked. Juice, soda, water, coffee, vodka, rum, whiskey, wine...I would buy it all. Needless to say, that was going a little overboard. Nowadays, I tame my urge to make sure everyone has their absolute favorite thing to drink in front of them. And you know what? Everyone is cool with it. 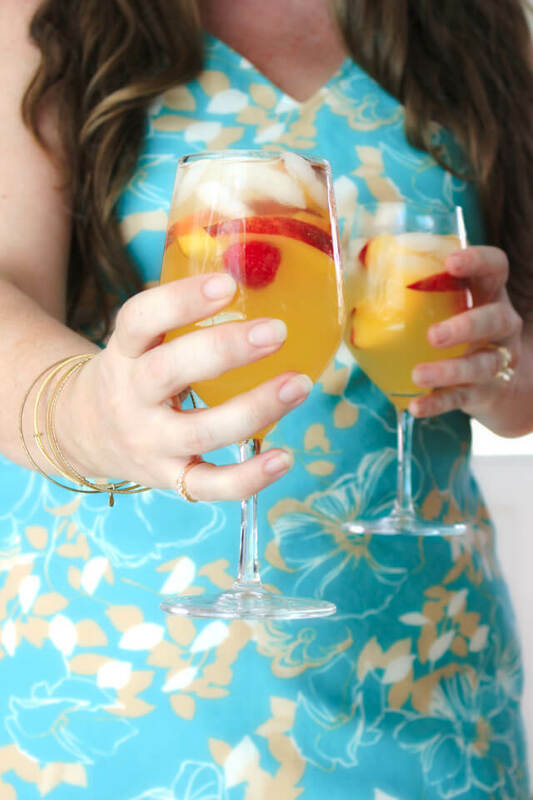 As a matter of fact, when you mix things up and make a fun party punch, everyone loves it! You totally don't need a million and two different kinds of booze and mixers to throw a good party. Picking up a few bottles of 7UP at Target makes the drink portion of my party planning a breeze. 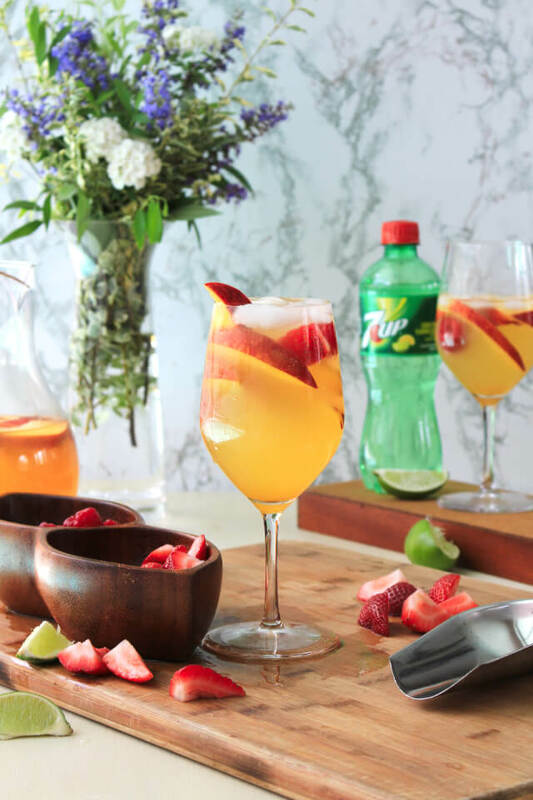 With its crisp, clean taste, I can serve it by itself, or I can let it shine as a key ingredient in a delish party cocktail like this Moscato Peach Punch! Making a signature cocktail in a large batch (like this punch!) is a classy addition to any party menu and keeps things simple and streamlined. 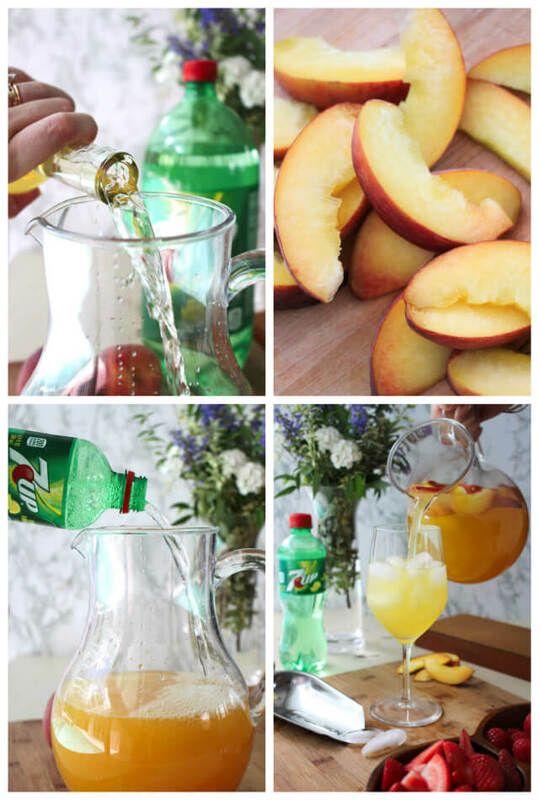 This Moscato Peach Punch is perfect for your summer parties! It's ideal for people who love sipping on a sweet cocktail while soaking up the summer sun. 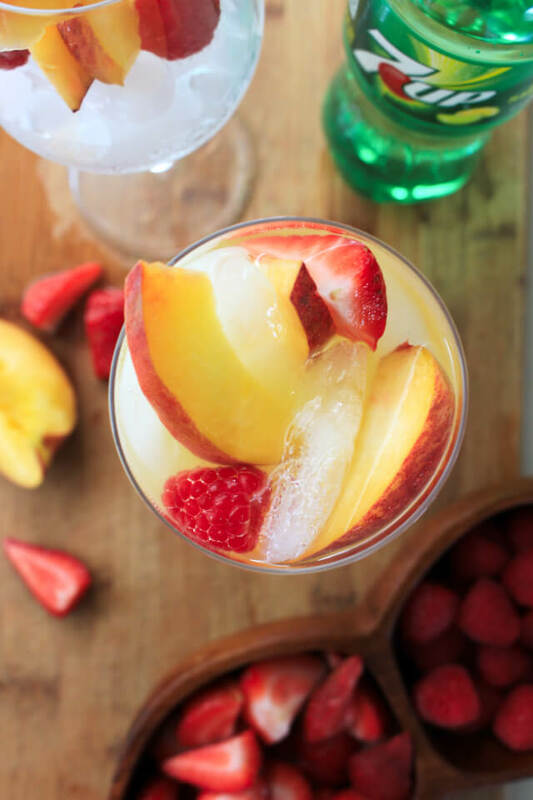 Gorgeous fresh peaches are added to a mixture of Moscato d'Asti wine, peach nectar, and a squeeze of fresh lime juice. Right before serving, you top it all off with 7UP for that irresistible bubbly fizz. Know what's super fun? Let your guests customize their punch with garnishes of their choice! I chose to serve this punch with fresh raspberries and strawberries, but you could easily add lemon or lime wedges, orange slices, or even fresh herbs as mix-in options. Set up a cute little punch station at your next party and see how much fun it can be. I promise, your guests will love it! You can prepare this punch in advance, which is a total lifesaver when you're a party planning fool like I am. I actually recommend preparing this punch ahead of time so that the fresh peaches have a chance to mingle with the wine. That being said, you should always add the 7UP right before serving so that it really shines. 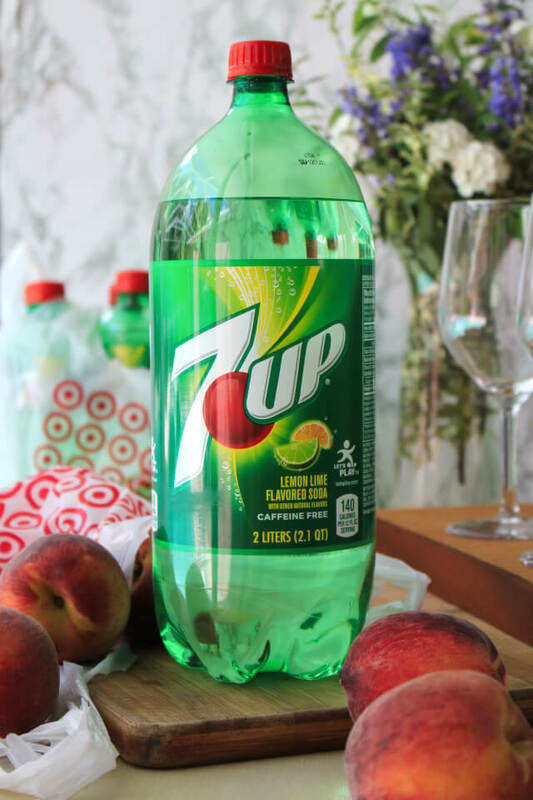 Don't forget that 7UP doesn't just have to be poured into a glass. Try adding some sparkle to your baked goods or use it as a key ingredient in your next marinade for your grilled fare. The possibilities are endless! Sooooo, has my party planning enthusiasm rubbed off on you yet? Keep things simple when you're hosting by making this fab punch. Swing by Target before your next shin-dig and pick up some 7UP with your other party goodies and let the good times roll! 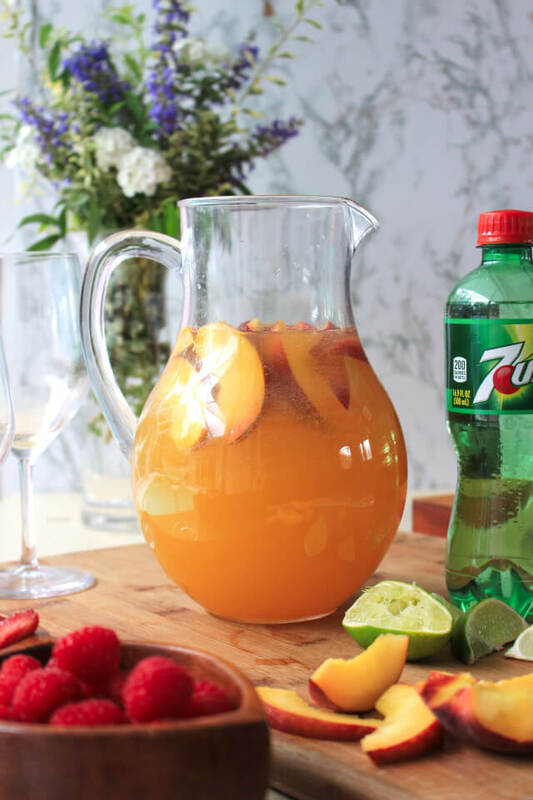 If you're looking for more awesome party planning ideas, head on over to visit my friends at 7UP for more savings, some sweet inspiration, and simple summer recipes for your next get-together! 1. 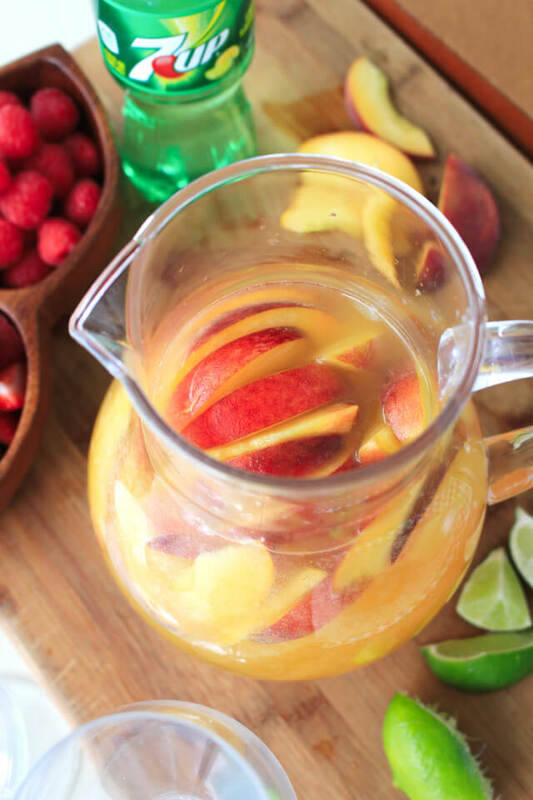 Mix together the Moscato d'Asti, peach nectar, fresh peaches, and optional lime juice in a pitcher. Refrigerate until ready to serve. 2. Just before serving, add the 7UP to the pitcher and gently stir. 3. Pour over ice and garnish with some of the peaches from the pitcher, as well as fresh strawberries and raspberries, if desired. The fresh lime juice cuts the sweetness of this punch just a bit and adds a fun flavor twist. It can be omitted if desired. Moscato d'Asti is a sweet dessert wine. If you prefer, it can be swapped with another white wine variety such as Pinot Grigio or Sauvignon Blanc. For an extra kick, try adding a peach flavored vodka floater to your glass of punch.